The reverse of this Silver coin depicts a colored traditional Chinese dragon holding a pearl. In Chinese mythology, the Dragon is often shown carrying a pearl to represent its great wisdom, hence the term "Pearls of Wisdom." 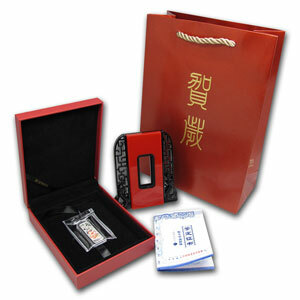 The image is backed by an engraved Chinese symbol for "Dragon." The weight of 1/2 oz and fineness of .999 Silver is also displayed. The obverse displays the Raphael Maklouf profile of Her Majesty the Queen Elizabeth II as well as the date of 2012 and Niue, Two Dollars. 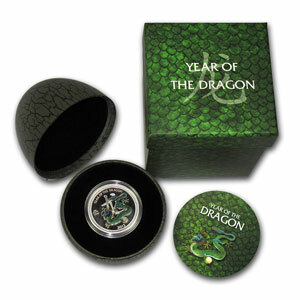 This Silver coin comes to you in a realistic protective dragon’s egg tucked carefully in a green dragon scale box along with a numbered certificate of authenticity. This is a very neat collector’s coin that will not last long with such a low mintage.